Tonight’s Golden Snitch Walk was called on account of no snitches. In mid-March the evening air was buzzing with them. As I closed the gate on evening chores, two American Woodcocks–the absolute model for J.K. Rowling’s glittery winged ball, or I’ll eat my Ravenclaw hat–twisted in their funnel-cloud dance not more than 20 feet above me. Then it got cold; freezy enough for S’more to agree to keep his thermal goat coat strapped on just a little while longer. Our first scheduled woodcock walk was windy and chilly. We saw deer and Indian hemp, counted birds and tracks. But snitches were nowhere to be seen or heard. That didn’t changeover the next few weeks. I told the April 6 preregistrants that the birds had come and gone for 2019. This dead tree is home to woodpeckers, fungi and all sorts of creatures. Snitches aside, today was a gorgeous day; the first real spring day that we’ve had since one random warm breath in March. I walked the planned walk route, dipping a net into the quarry. Its waters team with dragonfly and damselfly nymphs, snails and shrimpish scuds. No mosquito larvae dare swim near the predatory odonata; such is the beauty of a healthy wetland. No frog egg masses string the surface yet. There are frogs and toads clucking, burring and trilling from the quarry’s edge northeast across the vernal pools of Coburn’s Bottom to the property line at Riley Creek. All those Hey-Baby-Baby-Babies mean tadpoles are brewing in the slurry. A toad hops across the trail in front of me, not a snitch but gold all the same from the lowering sun and amphibian afterglow. Two Canada geese sail in for the night, skidding across the quarry’s still surface. The ripples haven’t yet subsided when a small flock of wood ducks join them. I hurry along the path to bridge Cranberry Run so as not to scare them away. I’ve just climbed the hill and am up and out of the preserve when, behind me, I hear an airborne whistling. I look up to see a winged softball arc over the quarry. Rain brings out the green, doesn’t it? The heavy drops and puddles also force those creatures that live in and under the leaves out into the open. There’s a t-shirt in it for whomever responds first (in the comments here at http://www.thequarryfarm.org) with the correct identification of the burgundy wildflower. 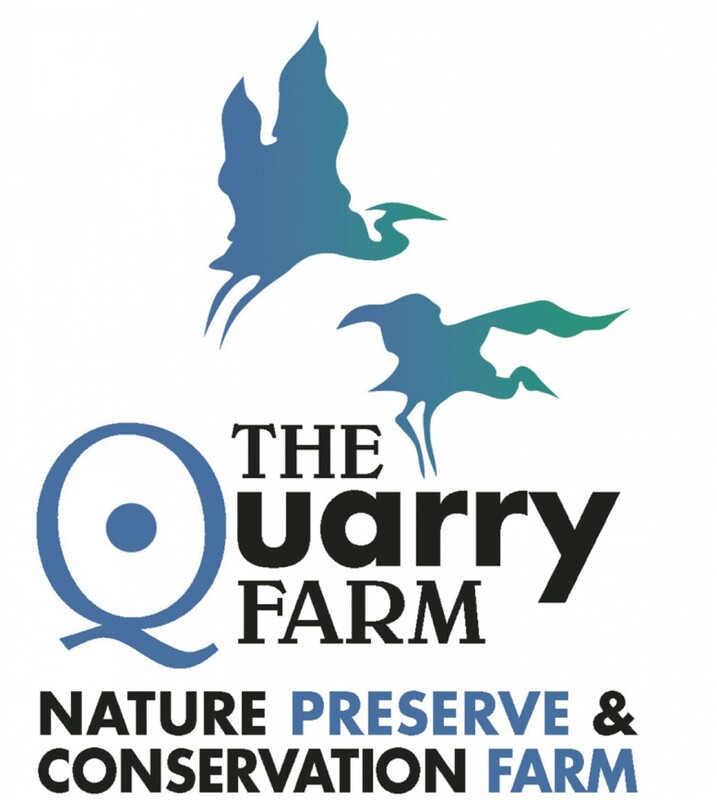 This latest issue is packed with information about wild spring babies (and what to do if you find one or more) resident news and announcements for upcoming events on The Quarry Farm Nature Preserve and Conservation Farm. Click on the cover to the left and read for yourself. 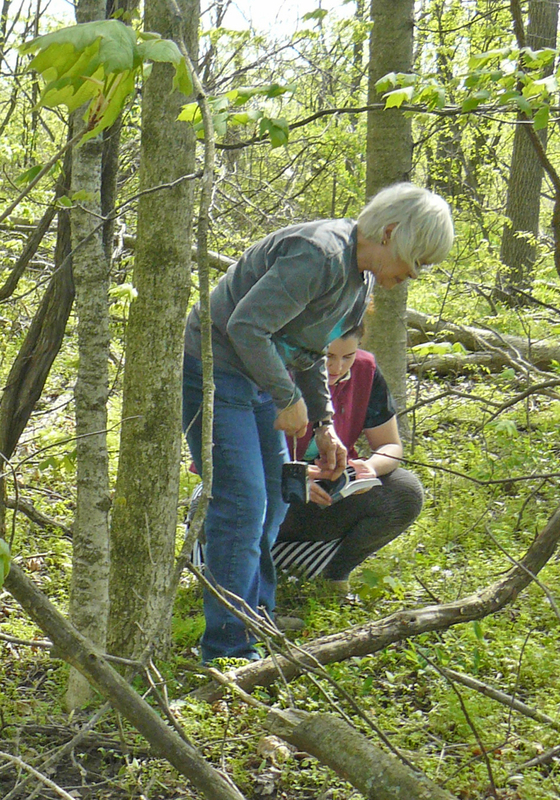 Hope to see you on the trails as we search for wildflowers, salamanders, constellations and photo opportunities. I titled this post what I did a) to get an eye-roll from you and b) because that is just what several of us did last Saturday. Cameras were slung over shoulders as intrepid amateur botanists crossed Cranberry Run to record spring wildlflowers on the Quarry Farm. 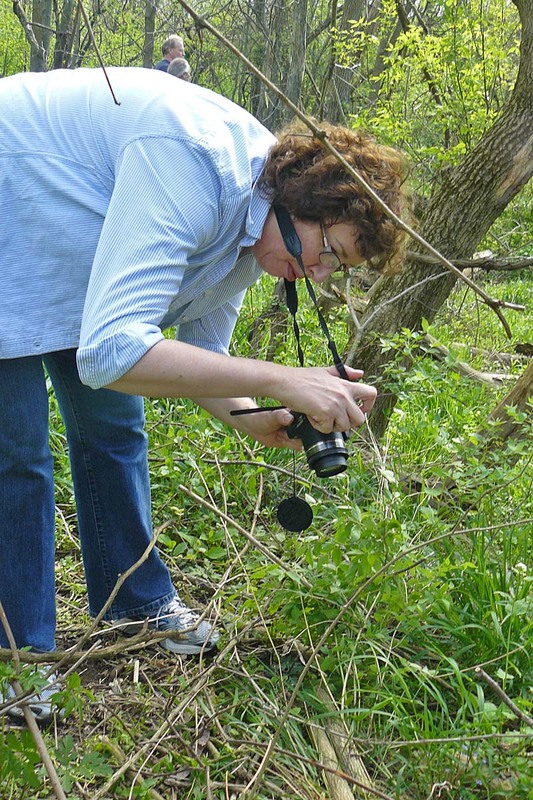 The “first really good time walking through the woods taking photos of pretty things” Spring Wildflower Photo Shoot and Sketch Walk resulted in a good list of the showiest wildflowers that Northwest Ohio has to offer in May. At least those that we could identify. A late blooming season resulted in here-and-gone bloodroot blossoms and trout lilies, but we did see the distinctive foliage. The same cool conditions did mean that ramps were still green and a few Dutchman’s breeches were starched white and puffed. There is a new trail cleared for visitation around the old oxbow, a site rich with engraved brackets, soft moss and woodduck calls. An expanding forest of mayapples lines the ridge of this young path. Here’s the list, common names only, and a few photos of flowers and other wild things seen that day. The gauntlet is down, Becky. Let’s see what you’ve got on your box.